True story excerpted from a facebook exchange on artist Lou Beach's page between me and my mother. ME - During the last years of a man's life he went on a drinking binge and drove his car over the neighbors' lawns in an upscale area of Englewood, New Jersey. His car crashed and the inebriated elderly entertainer proceeded to meander on foot drinking and tossing mini liquor bottles as he made his way home. My mom's artist friend gathered the bottles on her morning dog walk as though she were picking up pebbles left by Hansel and Gretel. When she picked up the last bottle it had lead her to her neighbor Wilson Pickett's front door. She gathered the bottles into a neat little art assemblage wrapped with the yellow CAUTION tape from the car crash scene that she named Pickett's Last Charge. This art piece is now in the collection of Zap cartoonist S. Clay Wilson. 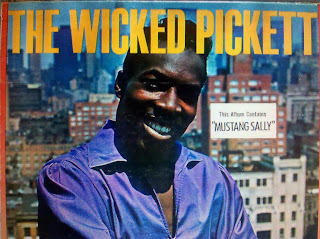 Luckily, Wilson Pickett had emerged unscathed from the wreck and nobody had gotten hurt. The lawns were dutifully restored and life went back to normal. becky, that story is about a musician named WILSON PICKETT. the artwork was/is called PICKETT's LAST CHARGE. my friend ann davis (formerly a jeweler, now a knitter), was a neighbor of mr pickett and apparently there were an abundance of little liquor bottles (the tiny kind) strewn in the vicinity of his house. one day mr pickett drove his car around the lawn of the mayor. i do not remember the extent of the crash involved, or even if there was a telephone pole involved in addition to deep ruts in the sod, but i believe there was some animosity between him and the mayor, for some reason or other. At any rate, pickett paid to have the lawn restored. meanwhile, my friend ann gathered up a few of the empty liquor bottles and a half a foot of crime scene tape from the scene, and made a little "cornell box" out of it, and called it "pickett's last charge."